These four tips, from Google, Microsoft and Forrester, can help CIOs and IT pros switch to Google for Work, Office 365 or any other new set of cloud-based productivity tools. Many CIOs and IT professionals have been conditioned to deliberate and wade through all potential negative consequences before making any sort of technology-related decision. This process often results in slow IT adoption, but thankfully the cloud is rapidly changing the dynamic. Cloud-based productivity suites such as Google for Work and Office 365 let technology leaders move faster, modernize their workforces and shift their efforts away from maintenance to focus on other IT projects. IT professionals need to consider many things as they weigh their options for cloud-based productivity tools, and as such they often overlook key issues during the evaluation process and eventual deployment, according to Liz Herbert, vice president of Forrester Research. Here are four tips from Herbert and representatives from both Google and Microsoft designed to help CIOs and their teams move to Office 365, Google for Work or any other cloud-based alternative. While IT managers frequently roll out new applications or features over long periods of time, cloud services let them adopt the latest updates or enhancements without delay. Speed is a core principle of the cloud, according to Herbert. The cloud can make it easier to add users, implement the newest features and get people excited about new technologies, according to Herbert. "Many of the cloud technologies are just naturally more intuitive" and built for mobile," she says. "[Cloud services] don't require some of the same user training and learning curve you see with more classic technologies." Bob Davis, Microsoft's vice president of Office 365 customer experience, says he tells IT pros to adopt a "services mindset," which can accelerate innovation. "The big difference between the cloud and on-premise is having continual access to the latest innovation rather than waiting years between releases," he says. CIOs should try to stay current on expected updates, and research how the changes might impact their organizations to determine how to best take advantage of them, according to Davis. Patrick Schablitzki, head of customer success and partner operations with Google for Work, says cloud services offer opportunities for continuous innovation, and he encourages IT leaders to seek out new ways to use Google Apps to enhance existing business processes. "Google Apps is constantly improving, so make sure you get the most out of it," Schablitzki says. "Engage with a certified Google professional services provider on a long term services strategy, and ask your team to make a deliberate commitment to transforming the business." Too many organizations veer toward cloud services without a clear plan and strategy to improve their businesses, according to Herbert. CIOs should lead the charge in establishing those objectives and be able to regularly measure results of their cloud-based productivity suites, she says. "CIOs who understand that they are creating business value by moving to [the cloud] and work closely with business leaders to articulate this value are more likely to get buy-in for the decision," Schablitzki says. When key business executives clearly understand the value of cloud services, IT leaders are usually empowered to make a "smooth transition and more rapid realization of the benefits of the platform," he says. 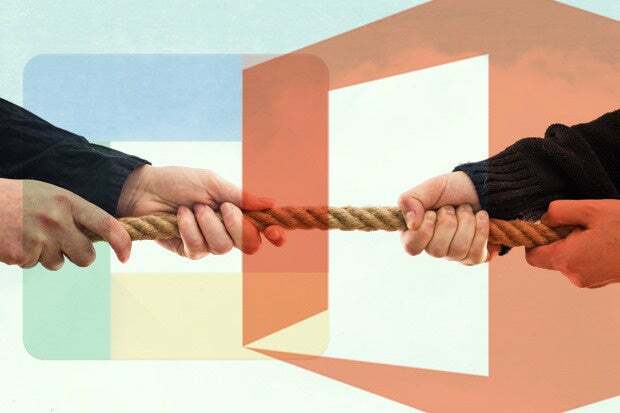 Businesses that are considering a switch to the cloud should define and specify the goals they want to achieve, such as increasing mobile use or adoption, according to Microsoft's Davis. "This helps you make the transition measurable and defines how you'll roll it out across the company to meet your goals." As IT leaders transition to the cloud they'll start to have more time to focus on other projects that generate revenue or otherwise create value for the business, according to Herbert. CIOs shouldn't waste IT resources managing a "pile of legacy technology" that doesn't add clear value for their companies, she says. CIOs should do their best to balance value and risk as they transition to the cloud, according to Herbert. "It's very easy to quantify cost, but very hard to quantify agility," she says. "Make sure you're looking at business impact as much, if not more so, than just the cost elements of these solutions." IT leaders also have the responsibility to craft and broadly share organizational visions for why they decided to embrace or make a switch to a cloud service such as Google for Work, according to Schablitzki. "Know your value statement and what it means to your broader staff." Instead of being "married to the old checklist of what you have to look for with IT," Herbert says, CIOs should focus on the specific advantages cloud services enable for their businesses and the value they get in return. Most organizations are inherently fearful of change, and IT leaders generally try to avoid rapid and complete transitions. However, CIOs that implement cloud services one application at a time miss the point, according to both Schablitzki and Davis. "The key to overcoming this resistance is strong executive sponsorship and a clear rationale for why the organization has chosen to move to [the cloud]," according to Schablitzki. Employees should have the freedom to adopt any or all cloud-based apps available to them, especially if the switch enables easier collaboration, faster innovation and greater productivity, he says. "The sum is really greater than the individual parts with these services," according to Davis. "Rather than going through multiple transitions to different services, do as much as possible at once. If you're going to go through the transition, do it right, don't just do it piecemeal." Schablitzki encourages IT leaders to "spread a culture of innovation" and set up interactive workshops to keep staff involved beyond the deployment phase. These working sessions should give employees the freedom to experiment and develop ideas to improve existing business processes using the new cloud tools, he says.